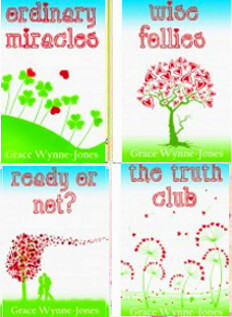 Grace Wynne-Jones is the author of four highly intimate soulful novels that have received critical acclaim and an enthusiastic response from many readers. 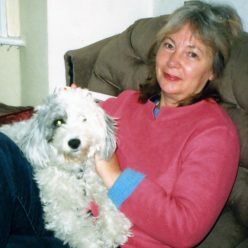 She has frequently been praised for the warm belly-laugh humour and tender observations in her writing and has been described as a novelist who tells the truth about the human heart’. She likes her books to feel like friends. Two of them have got into the bestsellers charts and, as an article in The Sunday Independent said, they are often about ‘older women looking for fulfillment and, yes love, in a complicated world’. Ordinary Miracles, Wise Follies, Ready Or Not? (which was described as one of the best Irish novels this year when it was first published) and The Truth Club are now available from Accent Press. The new editions were all published in 2007. Details about the books and sample chapters are available on on this website. Grace was born and brought up in Ireland and her early years were spent in a big rambling rectory in the Irish countryside. Her father was a Church of Ireland clergyman and, since there weren’t many Protestants in the area, he sometimes played LPs featuring hymns sung by the choir of St. Martin in the Fields in the local church. Passers by who did not know about the recordings must have been amazed by the choral grandeur…given that there were usually just a few cars and the odd bicycle outside the church during the services. She has a great love of the countryside. Her first big love was a pony called Merrylegs. ‘A self-published work with a print run of one copy, it featured a woman, a horse and a puppy on the cardboard cover, and the singer John Paul Jones on the back. It contained two stories. One was about my pony Merrylegs and another was about the joys of nature, so it didn’t quite live up to its title. But Mum and Dad liked it. Encouragement is invaluable to a budding author…Though I still adore ponies and nature these days I have extended my subject-matter. For example women’s lives fascinate me. And writing about them helps me to make sense of my own experiences. What’s more, I make all sorts of new friends as I type the chapters. Characters sometimes just seem to turn up, and I greet them hoping that they will share their hopes and disappointments, their fears and dreams and perplexities. I love intimacy in ordinary life…people who seem to understand. People I don’t have to pretend with. And that’s what the characters in my novels ask of my friendship with them. They want to take off their masks and tell it how it truly is. Sometimes male characters do this too and I almost fall in love with them. For example I find Charlie in ‘Ordinary Miracles’ deeply fanciable. And Nathaniel in ‘The Truth Club’ would make a most wonderful confidant. Grace has also lived in Africa, the US and England. Her feature articles have appeared in many magazines and national papers in Ireland and in England, and her radio play Ebb Tide was broadcast on RTE 1. Her short stories have been published in magazines in Ireland, England and Australia, and have also been broadcast on RTE and BBC Radio 4. She has produced and presented a radio documentary about the land, legends, and legacy of the Hill of Tara which was broadcast on Newstalk in 2008. Her radio documentary ‘Lights, Stop Messin’, Action!’ (about young film-makers) was broadcast on Newstalk in Febrary 2011. She has a deep interest in psychology, spirituality and healing and she also loves to celebrate the strangeness and wonders of ordinary life and love.